From out of hiding comes the Fool, into the sunlight, as if being pulled up from some low, dark point on a wheel. It is time for a change. Staff in hand, he heads back out into the world, expecting nothing. But, strangely, things seem to happen to him as the hours go by, good things. Wandering by a water wheel a woman offers him a drink in a golden chalice, and then urges him to keep the cup; as he wanders by a windmill, he stops to watch a young man swinging a sword; when he expresses his admiration of the weapon, the young man presses it into his hand, insisting that he take it. And finally, when he comes upon a rich merchant sitting in a wagon, right over one of the wheels, the man hands him a bag of money. "I decided to give this to the tenth person who walked past me today," explains the Merchant, "You're the tenth." The Fool hardly thought he could still be surprised, but he is. It is as if everything good that he ever did in his life is being paid back to him, three-fold. All luck this day is his. With Jupiter as its ruling planet, the Wheel of Fortune is all about luck and change. 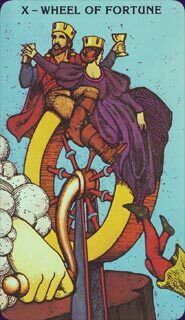 The wheel symbolizes completeness as well as the rise and fall of fortunes and the message that what goes around comes around. Almost every definition of this card indicates abundance, happiness, elevation, or luck; a change that just happens, and brings with it great joy. As much as the Tarot is about what a querent can do to change their life or self, there are cards that admit that sometimes you just get lucky. Sometimes things happen to you over which you have no control, and you rise of fall on that turn of the wheel. This is the card about how we sometimes find ourselves soaring up or down on life's Ferris wheel. The Wheel can mean movement, change or evolution, and in that respect it can be about how we all change positions, some of us rising some of us falling, some dropping to a nadir, some reaching a zenith. 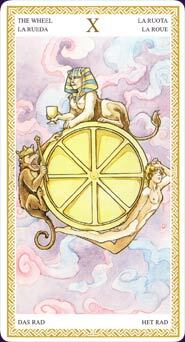 Most of the time, however, this card suggests that such changes will bring with them good fortune. The person you're reading for is going to get that money, that job, that promotion, that marriage proposal, that break they've been waiting for. Call it karmic payback for all the good things they've done in life - destiny or just luck - but whatever lotteries are out there, large or small, they've just won one. Learn the Wheel of Fortune tarot card meaning and the rest of the card meanings, symbols and stories in our eBook.